I’m doing my best to savor these last few days of summer foods before I start going crazy with my new Weight Watchers fall Recipes. So, with some fresh summer zucchini and heirloom tomatoes on hand, I created this simple vegetable recipe that was delicious and light. My Baked Zucchini and Tomato Casserole Recipe is the perfect, low calorie side dish to go with a chicken or fish entree. The simplicity of the recipe highlights the natural flavor the vegetables. And it’s a great way to use some those extra zucchini and tomatoes that you may have on hand. I used some beautiful heirloom tomatoes in my casserole, but just about any other tomatoes would work just as well. Just 5 Points per serving makes this a nice, filling side dish that won’t break the bank. Enjoy! A great, low calorie casserole recipe for summer, this dish is delicious. Flavorful, yet light, it’s a simple vegetable recipe that highlights the wonderful, natural flavor of zucchini and tomatoes. In a small bowl, combine basil, oregano, garlic powder, salt and pepper. Spray an 11 X 13 casserole pan with non-fat cooking spray. Place a layer of zucchini slices along bottom of pan. Sprinkle lightly, but evenly with the seasoning mix. Then place a layer of tomatoes on. Repeat layers until all tomatoes and zucchinis have been used. 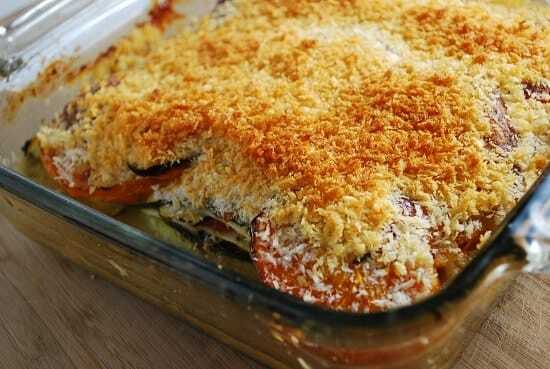 Remove from oven, and top casserole with parmesan cheese and then the panko breadcrumbs. Lightly mist with olive oil mister or non-fat cooking spray. When done cooking, remove from oven and let stand 10 minutes. Cut into 4 equally sized pieces and serve immediately. Super delicious and satisfying. Making it for the second time tonight! Like others have done, I added more cheese in between the layers and also get creative with the addition of extra veggies — mushrooms, spinach, etc. My two year old even loves it! Made this recipe, loved it as it is WW friendly. One problem: The directions say cut into 6 equal pieces but the NOTES say 4 pieces for 5 points each. If you cut it into 6 pieces it then becomes 3 points each–I like that. Just sayin. Made this yesterday according to directions. Was absolutely delicious AS IS. There’s no reason at all to alter it. Everyone loved it and I’m planning on making it again very, very soon. THANK YOU for a very sensible and delicious recipe! ?? Loved this dish!!! We also altered it to add 1 lb. extra lean hamburger and 1/2 lg. onion sauteed in between the 2 veggie layers. Everyone loved this dish as a main entree with a small caeser salad & lite dressing. NOM NOM! I really enjoyed this dish. It is substantial enough for a main meal but makes a nice side dish too. It is very visually appealing to the guests. The flavors are great. Nice texture. This was so delicious! Even my picky 18-month old loved it. A few alterations I made: I only used 1/2 cup of regular bread crumbs. And I added 3/4 cup of part-skim mozzarella cheese. I will definitely be making this again. Thanks for the recipe!